The following article, drawn to our attention by Emlyn Jones, appeared on the BBC News website for North East Wales. 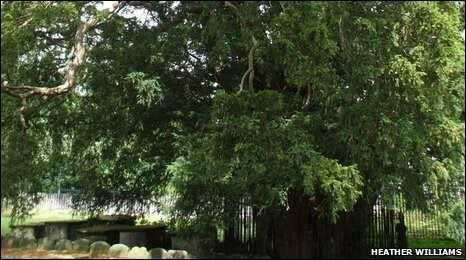 Gresford's yew tree, known as the Old Lady has been growing in the churchyard at Gresford for more than 1,500 years - and now it's time to see how big she's getting. Tree expert, Rob McBride, is measuring a number of Gresford's famous yew trees and he needs volunteers to help as their span is so great. The trees stand in the churchyard of All Saints church. The most famous of them is known as the 'Old Lady' and is thought to be more than 1,500 years old. Other yew trees were planted in the early 18th Century. The event is taking place as part of the project which aims to help people conserve and explore the history and wildlife to be found in their local churchyards. Sue Kelly, a volunteer co-ordinator for the project, said: "The Gresford Yews have attracted attention over the last 200 years and articles about them have appeared in various publications. "The 'Old Lady' has been measured several times since 1808. The last record dates back to 1984, so as a quarter of a century has elapsed since then, it seems an ideal time to update the records of the yew trees in the churchyard."